Head coach Kevin Dineen has fired by the Florida Panthers on Friday, just five days before Finnish Fan Night at the BB&T Center. The Panthers have stumbled to a 3-9-4 start, as Dineen’s team was 18-36-10 since making the Stanley Cup Playoffs in 2012, the first time in 12 years the Panthers were in the postseason. 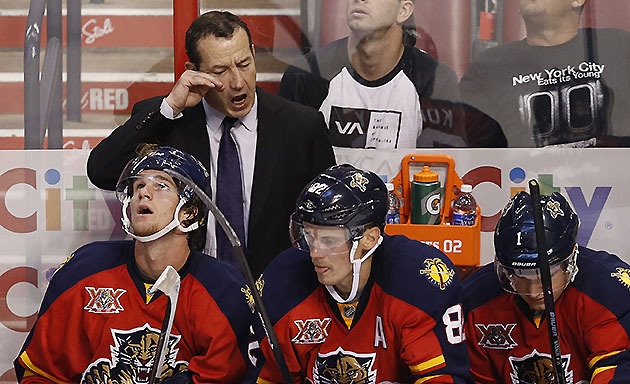 The punchless Panthers lost to the Boston Bruins last night in Dineen’s final appearance behind the bench. They're 28th in the league on defense (3.38 GA/G) and 26th in offense (1.94 G/G). “We probably had three competitive guys,’’ Dineen said, mentioning Shawn Matthias, Jesse Winchester and Mike Weaver. “That’s not enough to drag the whole group along. Injuries have played a role: Sean Bergenheim was limited to four games and Tim Thomas has played just six, and injuries really hampered the team last season. But the reason why Dineen was fired was because he could no longer coax better than expected performances from the patchwork of a roster created by his general manager, which is why the Panthers made the playoffs two seasons ago. Take a player like Kris Versteeg, who averaged 0.76 points per game in that playoff year and is at 0.33 through 15 games this season. Shawn Mattias’s numbers are down. Tomas Kopecky doesn’t have a POINT this season. Rookie of the year Jonathan Huberdeau has three goals in 16 games; ditto Aleksander Barkov, expected to be this year’s rookie sensation. Does this look like a playoff team to you? In the Atlantic Division? Of course not. Dineen suffered the same fate Peter DeBoer did in Florida, which is that he didn’t have the horses to compete and those who could would run off to another barn and were never replaced. Gone from that 2012 playoff team: Stephen Weiss, Jason Garrison, Mikael Samuelsson. The first two haven’t even come close to being replaced after leaving for Detroit and Vancouver. Scott Gomez and Ryan Whitney, people. Scott Gomez! Firings come down to one of two things: Coaching or construction. The failings of the Panthers fall on the front office, either on Dale Tallon’s personnel decisions or the ones he couldn’t make due to the ownership situation (now settled) or the fact that the Panthers aren’t a prime destination for elite free agents. Florida Panthers Executive Vice President & General Manager Dale Tallon announced today that head coach Kevin Dineen, assistant coach Gord Murphy and assistant coach Craig Ramsay have been relieved of their coaching duties. Goalie coach Robb Tallas, video coach Jason Cipolla and strength and conditioning coach Craig Slaunwhite will remain on the staff. Florida Panthers Executive Vice President & General Manager Dale Tallon announced today that Peter Horachek has been named the club’s new interim head coach. In addition, the team announced that both Brian Skrudland and John Madden will join the Panthers staff as assistant coaches. Horachek, 53, becomes Florida’s 12th head coach in franchise history after most recently serving as the head coach of Florida’s American Hockey League affiliate, the San Antonio Rampage. Prior to working in San Antonio, Horacheck spent nine seasons with the Nashville Predators (2003-2013), serving his last two years as associate head coach. While working for the Predators, he helped the club advance to the postseason on seven occasions. Horachek has also served as the head coach for the American Hockey League’s Milwaukee Admirals (2002-2003), ECHL’s Trenton Titans (2001-2002) and the International Hockey League’s Orlando Solar Bears (1999-2001), where he won the 2001 Turner Cup. Skrudland, 50, has spent the last four years as the team’s director of player development. He served as Florida’s first team captain, appearing in 256 games with the Panthers (1993-97), while guiding the club to the 1996 Eastern Conference Championship and the Stanley Cup Finals. Throughout his 15-year NHL playing career, Skrudland played in 881 career National Hockey League contests for Montreal (1985-93), Calgary (1992-93), Florida (1993-97), NY Rangers (1997-98) and Dallas (1997-2000), registering 343 points (124-219-343) and 1,107 PIM. He won Stanley Cups with the Montreal Canadiens (1986) and Dallas Stars (1999). After his retirement from playing at the age of 36, the Peace River, Alberta, native returned to the Flames organization as an assistant coach for three seasons (2000-2003). Madden, 40, returned to the Panthers this season as a pro scout after helping the team win the 2011-2012 Southeast Division Championship. Throughout his 13-year playing career, Madden played for New Jersey (1998-2004 & 2005-2009), Chicago (2009-2010), Minnesota (2010-2011) and Florida (2011-2012), earning three Stanley Cup titles (New Jersey 2000 & 2003; Chicago 2010). The Toronto, Ontario, native played in 898 career NHL games, recording 348 points (165-183-348) and 219 PIM. He was awarded the Frank J. Selke Trophy in 2001. After his retirement in 2012, Madden spent one year with the Montreal Canadiens (2012-2013) serving on their scouting staff.